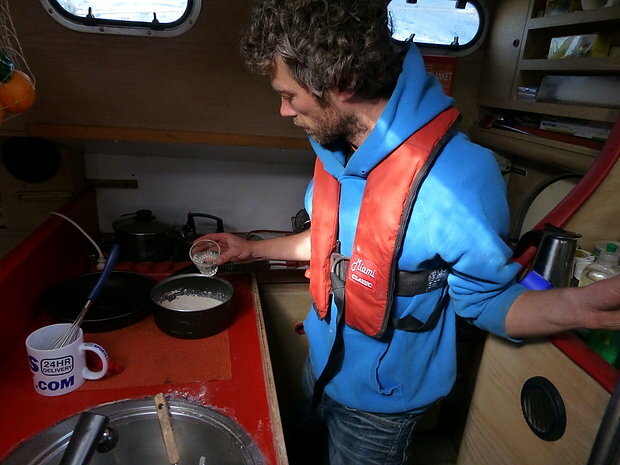 My fellow adventurists started trundling in as early as October, when Kyle made a first appearance on the islands. We did a bottom paint job and put boaty back in the water together. Finally my friend Timo, veteran of the 2011 Southbound operation, and the charming Cecilie landed. Another frantic few weeks of fitting new solar panels, changing batteries, and making and installing a keg-a-cue (bbq made from a beer barrel) followed. Fuerteventura’s December nights were cold enough to warrant jeans or a sweater at night, a fantastic reason to sail south-by-south-east, to the Cape Verde Islands and thus – the tropics. 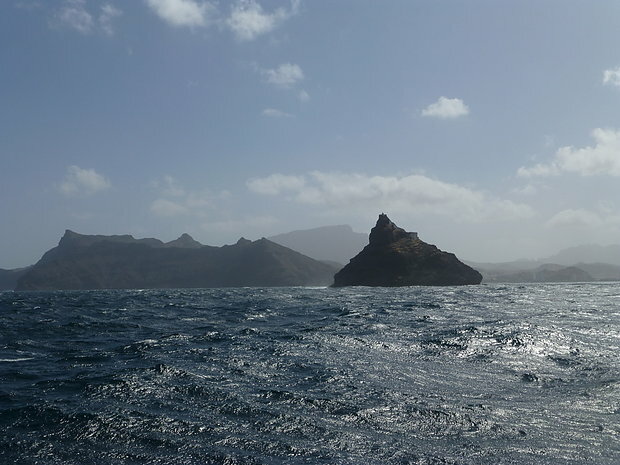 We set off on the 905 nautical mile passage on Christmas day, an auspicious date for departure if you give any credence to certain primeval tales, and immediately ran into a “yachtsman’s gale”, 6-7 bf with big swell from the Gran Canaria acceleration zone. I later received news that a friend of a friend’s boat sank not far from us that very day. I had just done the washing up and was feeling pleased with myself when I looked up to see a big valley of water behind the sea we had just slid down, the mizzen gybing, the foot of its boom parting with an impressive bang and aluminium shards flying around. We all scrambled to get the sail down and secure the boom. Even though a ketch has two masts and hence two booms, and the mizzen is anything but essential, we were all a bit traumatised by this event. 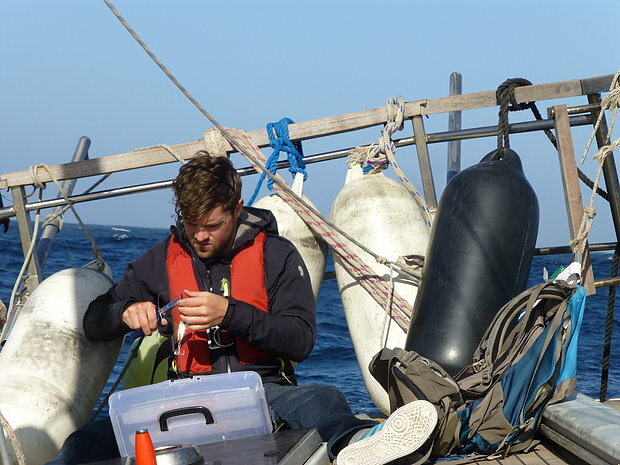 The weather had also been a harsh intro to ocean sailing for the relatively inexperienced sailor Cecilie. 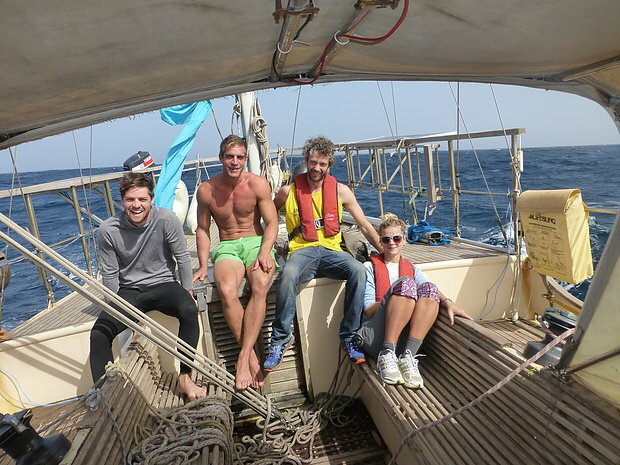 While most people start with a few day trips around the Baltic sea, the brave Cecilie went straight for the week-long offshore passage in the mid-Atlantic, impressively insisting on standing her watches in spite of her nausea. Luckily our neighbour in Gran Tarajal, Werner, had taught us how to bake bread in a pan, and Timo produced some every day. Which was great for morale. On ocean passages I often wonder why I do this to myself time and again when I could be insert random vision of decadence. On the third night, however, the winds calmed down to a much more reasonable 4-5 bf, and, while gliding across the moonlit, nearly flat silver sea, I felt rewarded and pleased with the world and actually had the words of a poem coming on. Something about moons and nights. And perhaps horses. Yes. Horses. Wer reitet so spät durch Nacht und Wind? It soon occurred to me that the words were actually Goethe’s rather than my own, and I went back to docking lager fantasies. We settled into a fairly comfortable routine of 4 hours on, 12 off, which gave us plenty of time for a bit of fishing, even though the only beast we had on board was a suicidal flying fish that conveniently landed on deck by its own volition. I wish tuna did that too. My father was giving us weather routing information via my newest toy, the satphone, which I just had to answer by saying “Dr. Evil speaking” for some reason. On day five, he notified us that the winds were due to pick up again. I discovered that the genoa had also been damaged during our early accidental gybe, meaning that I couldn’t reef it properly, leaving us overcanvassed. 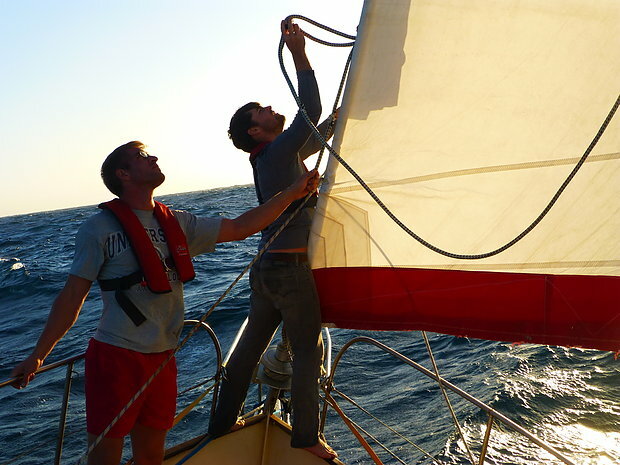 On day six, the genoa forestay parted after 12 hours of strong wind during Timo’s watch. We spent the afternoon trying to secure the sail and stay in some fashion. Our team had by then become a well-oiled crisis management machine. I for my part had become fairly blasé by this time, I was relaxed about being at sea and just wanted to keep the show on the road. We managed a reasonable speed with our two remaining sails, the tiny working jib and main sail, not exactly an optimal setup for downwind sailing. We reached the Tropic of Cancer (23N) later that night. I finally sighted land on the 8th day. São Vicente and neighbouring Santo Antão, two huge rocks of desert and the first bits of dirt I had seen since Fuerteventura, looked unreal in the haze. I shouted “land ho” into the direction of the sleeping crew, which technically means I’m excused from paying my share of the docking lagers. 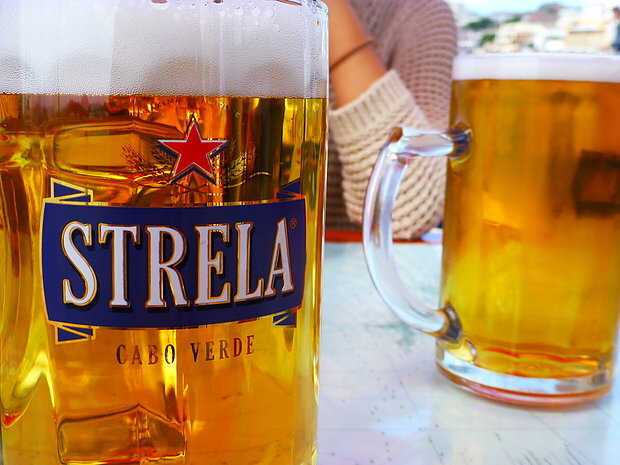 The newly expanded marina at Mindelo yielded a couple of most well-deserved Strelas, and we were all euphoric and pleased to have made it. 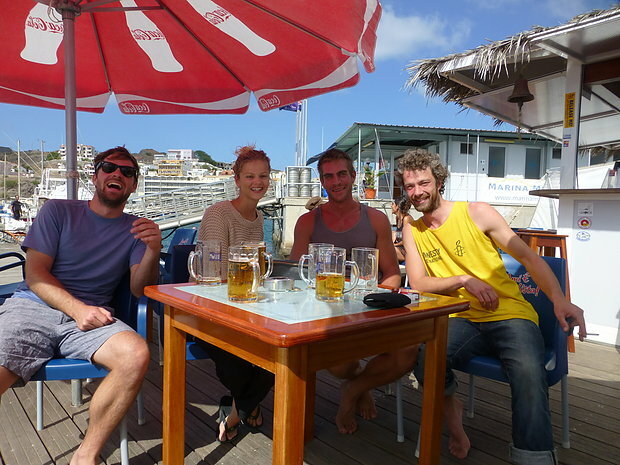 The port is full of fellow aspiring transatlantic adventurists, and we quickly made friends. We will be spending a few weeks attending to our issues here before we push off for Brazil.